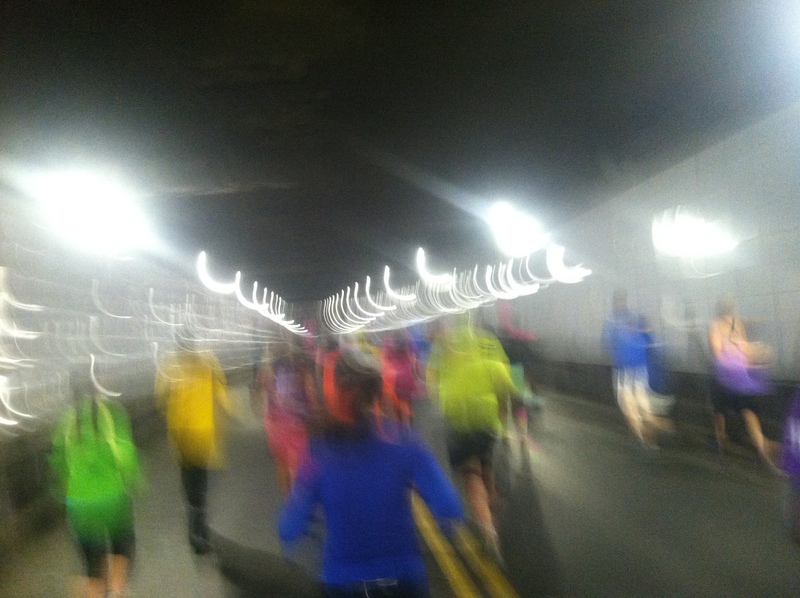 People running through the tunnel during the Detroit Marathon in 2012. I often hear people say they hate running. Or they only run when being chased. I understand. I hate running too. For about three miles. Almost every time I run. For the first few miles of any run, I don’t like running. It takes a bit to get in the groove and then once I’m there I love it. I’m sure there’s some simple scientific explanation for this, but that really isn’t important to me. I know that I may be stiff and slow and grumpy for a bit, but I’ll loosen up and feel great in a short while. Running is a mental sport more than a physical sport. I have mental barriers at mile 2 or 3, then at 5, at 8, and at 16. Beyond that, I don’t have enough experience to know if/when I have further blocks. Once I started figuring these out, I became more comfortable knowing that pushing through was all I needed to do. Now, if you’ve read my post about my marathon, it’s obvious that mentally I’m having some trouble recently so I have to remind myself about these barriers and constantly tell myself I have gotten past them before and will again many many times. ← I love my training group!